The Jeep Cherokee bears the heritage of a brand synonymous with serious and supreme off-roading. As a result, safety on this compact crossover SUV has to be top priority. 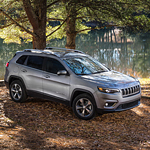 It’s why the Cherokee sports a sturdy unibody structure and is equipped with eight advanced airbags. Made of high-strength steel, the Cherokee’s body is tough and durable. Unlike body-on-chassis construction, this SUV’s unibody is primed for ultimate physical integrity. Inside the vehicle, you have two front impact airbags facing the driver and front passenger, two bolster airbags for their knees, a pair of front seat-mounted airbags for side protection, and a pair of roof-mounted side curtains that line both sides from front to back for head protection. If there’s ever a crash, you will receive all the restraint and cushioning you need due to these airbags. Call us today to set up an appointment with one of our sales specialists and find out more about the Jeep Cherokee’s safety features.